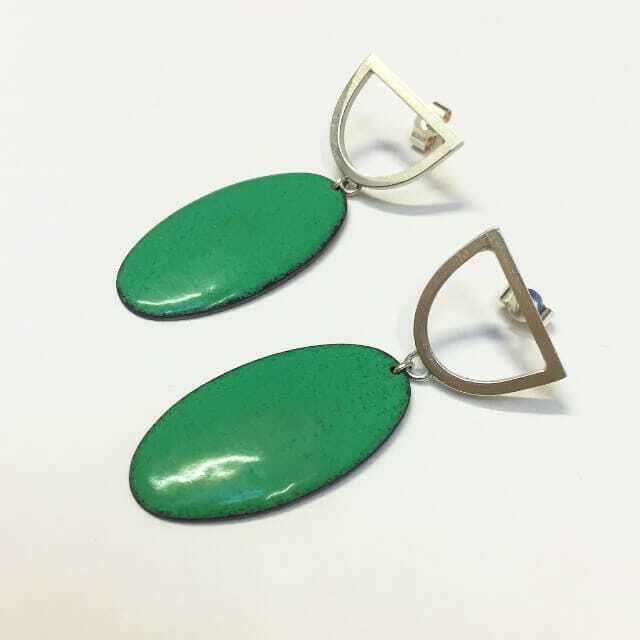 Statement pair of oval earrings with a half circle, silver frame and an enamelled copper oval drop. Sterling silver posts and backs also which will keep them securely in place. Colours may vary with the nature of enamel making each pair completely unique! Due to the nature of enamel colours can slightly vary making every pair completely unique! Inspired by the shape of the propeller of a Spitfire plane and colours taking from letters and envelopes of post during WWII. Rebecca E Smith is the founder, designer and maker of Smith & Gibb, a jewellery adventure inspired by her grandparents, Trevor Smith & Margaret Gibb. Rebecca marries family sentiment with contemporary designs from her workshop based in Glasgow. Graduating in 2014 with a first class honours degree in Jewellery and Metal Design at Duncan of Jordanstone Dundee, Rebecca E Smith is continuing her love of designing and making jewellery under the name Smith & Gibb. Rebecca previously studied Jewellery Design at Cardonald College in Glasgow for three years before taking a place in 3rd year at Duncan of Jordanstone Art School, Dundee. After discovering over 300 love letters sent during WWII from her Granddad to her Grandmother, Rebecca E Smith has been captivated by the sentiment, the nostalgia and the greatness of a true love story over the years of 1943-1946. Truly touched by her Grandparents story, she creates enamel pieces in particular colour inspired by bright postage stamps and inks that were lovingly kept vibrant from these special envelopes. Now Rebecca mainly combines her enamelling skills with clean, simple contemporary design. Colour is especially important in her designs as it expresses that persons personality and sense of style whilst allowing the wearer to take a part of Rebecca's grandparents story with them.